Anthony Joshua says he is "unlikely" to fight on 9 July now fellow British world heavyweight champion Tyson Fury defends his titles on that day. WBA and WBO champion Fury is scheduled to take on Wladimir Klitschko in a rematch in Manchester. "It was always in my mind to fight on 9 July, but there are other dates as well," IBF champion Joshua, 26, told BBC Radio 5 live. "Let Fury and Klitschko have their day. Let's not mix anything up." Fury defeated Klitschko on points in Dusseldorf last November to become WBA, WBO and IBF champion. The Englishman was then stripped of the IBF belt that Joshua now holds and has yet to defend any of his titles. A future fight between Fury and Joshua has already been suggested, with both men confident of victory. 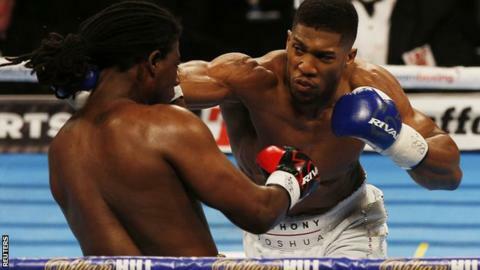 Fury derided Joshua as "slow" and "ponderous" following his second-round stoppage of IBF champion Charles Martin. and asked for a chance "to slay the lamb" in a highly lucrative all-British fight. Joshua's promoter Eddie Hearn has claimed a meeting between Fury and his charge would generate £40m, with both fighters picking up in excess of £10m. However, Hearn also said that Joshua would fight an American challenger next to take advantage of the surge in interest in his career. Joshua highlighted former WBC world champion Bermane Stiverne and undefeated American Dominic Breazeale as possible opponents. Stiverne, 37, lost his title to Deontay Wilder via a unanimous decision in January 2015 but has claimed on Twitter that he believes that he will fight Joshua next and will inflict the Olympic champion's first defeat. Fury, who calls himself "Gypsy King" on Twitter and is from a family of Traveller heritage, told BBC Sport that since becoming heavyweight champion he has suffered "more racial abuse". But Joshua said he has no sympathy for the Manchester fighter, citing Fury's controversial comments about women and telling him to "grow a thick skin". "Everyone has their opinion," said Joshua. "It's a social world and you just have to take it. "You take the good with the bad and that's just the world we live in. "Tyson, you need to grow a thick skin and learn how to deal with these things because sometimes he says negative things about people, about women and so on, and they have to deal with it. So sometimes you have to take a bit of backlash."